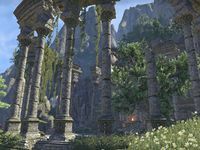 In Aldmeric, the name means Warlord's Mountain Lair, as these vast halls were originally built in the early First Era for the legendary Prime Battlereeve Fiirfarya. One morning the estate's entire populace was found slaughtered, and thereafter the site was abandoned. Tor-Hame-Khard is a delve found southwest of Shimmerene. It is occupied by the Sagacians, a group of researchers who according to Justiciar Tanorian are "truly no better than bandits", using any means to obtain their ends.